So what is the secret? Unlike western countries where you really need to know the traffic rules if you don’t want to get into trouble quickly, in Thailand you might be better off not knowing too much about the traffic rules. In general you are better off expecting the unexpected. This might be a little tongue-in-cheek, but there is definitely some truth to it. You have to take into account that the speed of traffic speed is a lot slower than in first world country. There density of population as well as traffic is a lot higher. So what works in Thailand would never work in Australia where you really need traffic rules at the speed of our traffic. Go with the flow would not work. 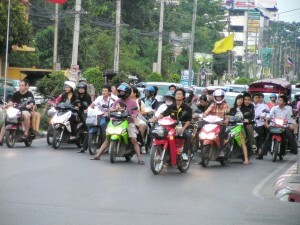 Yes, it is true, in most parts of Thailand people don’t drive very fast. Also the mentality of the people is very different from the Australians for example. Thais are generally quite patient and don’t get upset easily. Now I am all for traffic rules, I am just trying to explain how to get along in Thai traffic where rules are not followed as much as in Australia. I am not advocating go with the flow as the best model, it is just an inevitable model here in Thailand.